Home › Latest News › Ride to Jack Rabbits! On Saturday 25th February, we invited our customers and the general public to ride with us to Jack Rabbits for the Metro FM Awards after-party. 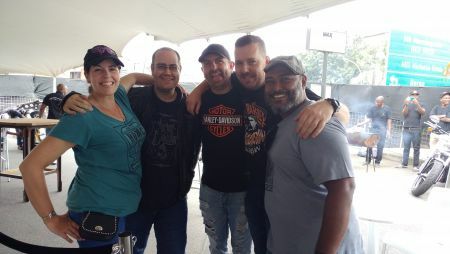 Everyone met at the Harley-Davidson® Durban dealership to ride at 4:15pm. With clouds slowly creeping over and breaking the heat a little, it was the perfect weather for a ride. We took a beautiful, scenic route past the beach and the iconic Moses Mabida stadium. You can image the excitement from pedestrians as a whole convoy of Harley® motorcycles rumbled through the streets! Upon arrival at Jack Rabbits, we were welcomed by the crowd that had already gathered for the night’s festivities. The smell of braai hung in the air as we settled in for a night of delicious food, dancing and even some arm-wrestling (us bikers know how to party!). With Lulo Café spinning smooth tunes and the venue filling up by the hour, we paid little attention to the rain that eventually made an appearance. Nothing could dampen the mood! After a few hours and with full stomachs, aching feet and massive smiles, we slowly made our way home. Thank you so much to everyone that joined us for this fun evening and thank you to Jack Rabbits for hosting us. We look forward to the next ride and hope you’ll be joining us too!